PC Jones installation team are equipped with a highly skilled workforce of qualified engineers. Our team install the best quality cleaning equipment systems for all cleaning scenarios (Food/drink, Farming and Transport.) All our work is carried out to the highest spec and is quality assured. We can offer many types of cleaning equipment installations, please look down the page and find what you are looking for. Our installation engineers are trained to follow onsite procedures and take interest in their work, ensuring quality is paramount. Reliability, professionalism and consistency is what makes PC Jones, therefore we will install each and every system on-time, without fuss and we do exactly what we say. We offer a variety of installation services, which cover installing new machines into building, sheds and out-buildings to the swap over of high pressure hoses. High pressure hose removal and fitting. Bespoke flue installations for static machines. We can install static machines with a fixed ring main system, allowing multiple operation points which enables the machine to be used all around the premises. This saves operators from dragging machines around the work space causing health and safety hazards, as well as decreasing productivity. Key operation – Allow specific people to operate the equipment. Ideal for high security sites. Coin operation – Let people use the equipment with payment, ideal for car valeting. Remote operation – Enables users to operate the equipment when they are not in direct contact with it. Ideal for Factories. 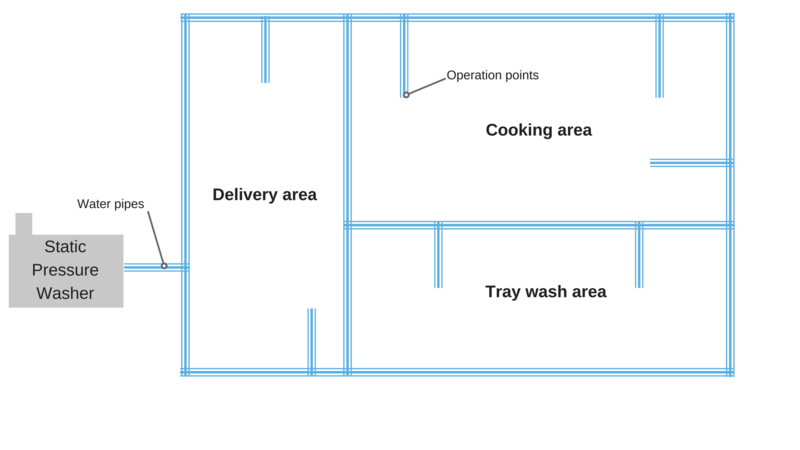 Below is a basic floor plan of a food factory with a ring main system. As mentioned before, all installations are bespoke so get in contact and let us equip you with a ring main system that is unique to you. Our installations team is well equipped to deal with hose reel wall mounting, frost protection and maintenance. We can supply, fit and maintain your hose reels throughout their life span, even through the frost. Our factory trained engineers can provide equipment like thermal insulation covers for your hose reels to protect against the water freezing inside the reels. So why do you need a hose reel? They make the working environment safer and it protects your hose at the same time. Most Karcher hose reels are self-winding, meaning that you do not need to manually retract the hose when operation has finished. This ensures that the hose is always kept out of the way apart from when it is needed. Tidy – Kept out of the way in a compact space, reducing the risk of slips, trips and falls. Self-Winding – Makes operators more likely to tidy the hose away. Lockable – Allows operators to pull the hose to desired length and lock it at that distance. Less Mess – The hose is kept off the floor more, keeping the hose cleaner. Give us a call or drop us an email today, we are more than happy to assist you with your need for hose reels.